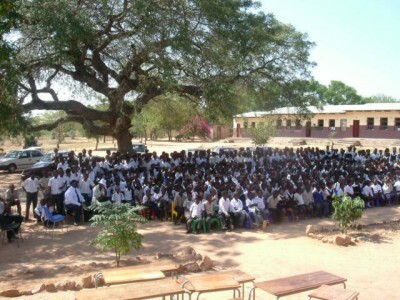 In 2004 Sgt Neil Kirkwood from the SA Air Force Fire Department approached Children of Fire to run a fire safety campaign in the Hoedspruit area, near the Kruger Park. Veld fires are a persistent danger but accidents at home are still common too and in 2004 in just one of many sad incidents, four siblings lost their lives in a shack fire. Their mother had left a candle burning next to the pillow of her sleeping children and went out. Two children died immediately and two others died later in hospital. In one night a mother lost her whole family. This tragedy should never have happened. The area currently lacks fire emergency services. The Bohlabela District Municipality has a Chief Fire Officer, Rexon Selinda, but no other firemen so they rely on teams coming from Nelspruit and other towns at least 50km away as well as the SAAF. However, the SAAF Fire Department is especially equipped for aircraft fires and cannot respond to all local emergencies. The District is setting up a local fire brigade, but it seems to be slow going so far. After the initial discussions with Sgt Kirkwood, Thomas Ranamane and Amelia Tandy, an Australian volunteer, visited Hoedspruit, Mpumalanga Province in October 2004 for a week. Working with Selinda, Kirkwood, Enos Maunye and Albert Mokoena from the district, they visited 50 schools to assess the resources available; notify them of the intended campaign; look for burns survivors who could be assisted by the charity; and meet with local police and hospitals to see how the area responded to emergencies. One of the biggest challenges for emergency services is the distances that need to be covered. Even splitting into teams, they struggled to visit five or six schools in a day. At the week's end the campaign was set for April 2005. Six months later, on a hot autumn day, the children sat expectantly in the makeshift hall, actually two classrooms with a sliding wall. As they listened to the introductions they couldn't help but laugh at the foreign lekgoa greeting them with "Dumelang" and "Lekai." The six volunteers began their play, telling the short story of two parents who went to a shebeen, leaving their two young children at home alone with a burning candle. The inevitable happened; the shack burned down and one of the children got burned, but fortunately a neighbour went to help. 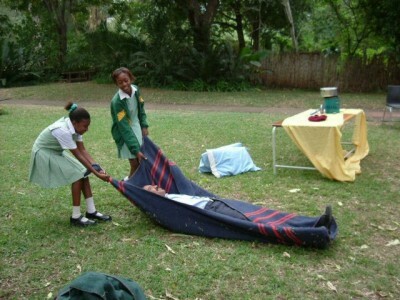 After the play there was a demonstration in which the pupils also participated. What is the emergency number and what should you put on a burn? Many, sadly, said "toothpaste or margarine". What should you do if someone drinks paraffin? Many wrongly said "milk to make the patient throw up". What should you do if you or your friend is on fire? How can you move an adult from a burning shack? These are some of the questions that Children of Fire's UMashesha volunteers answered when they visited the schools to teach the pupils about fire safety. The volunteers in addition to Ranamane and Tandy were Solomon Seabi, Terence Mbele and Josephine Mofokwane from Alexandra township, Johannesburg, as well as Nancy Kluth from Germany. South African volunteers brought local knowledge, language skills, First Aid, fire fighting, fire prevention knowledge and disaster planning skills to the team. During the campaign the language used for demonstrations changed from English to Sepedi; Sesotho; isiZulu and Tsonga so language skills were crucial. Kluth and Tandy brought management skills, burns survivor care and shack fire experience to the team. Children of Fire, the SAAF and the Bohlabela District Municipality together were a wonderful example of different organisations promoting community safety.